Take pride in your kitchen with these new very powerful canopy extractors, all the Lusso range of canopy cooker hoods have very powerful extraction with the added benefit of the baffle stainless steel grease filters, these commercial grade filters have been upgraded to polished steel and will remove 90% of grease before it reaches your motor. 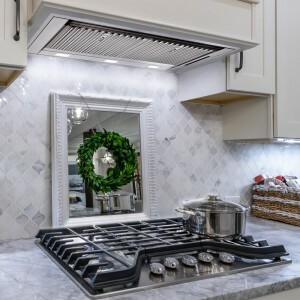 The added benefit of baffle filters is that they are tough, dishwasher safe, made form high grade stainless steel and look great, these filters are placed in your cooker hood at a slight gradient allowing for excessive grease to collect in a trough at the back of the filter, these are easily removed for cleaning and can be placed in the dishwasher with the baffle filter. The motor units on these canopy cooker hoods have a massive 1350m³/hr, more than enough for any domestic kitchen 25 x 25 square meters 2.2 high. Apart from the appearance baffle filters are more efficient than mesh filters because they permit the easier flow of air through the filter. When air passes through a baffle filter it must make 2 x 180° turns and in so doing must speed up to make that turn - when the air speeds up it deposits the grease and moisture onto the bend in the filters. Baffle filters are also better at eliminating the posibility of a fire running up into the ductwork and also reduce noise levels.